Gustavo Stolovitzky is the editor of Reverse Engineering Biological Networks: Opportunities and Challenges in Computational Methods for Pathway Inference, Volume 1118, published by Wiley. 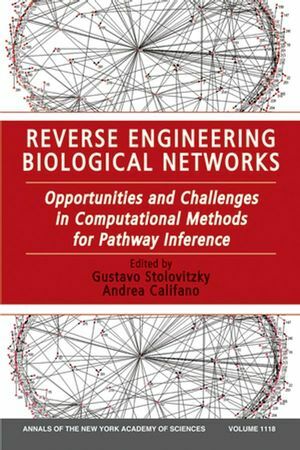 Andrea Califano is the editor of Reverse Engineering Biological Networks: Opportunities and Challenges in Computational Methods for Pathway Inference, Volume 1118, published by Wiley. Part I: Community Efforts for Pathway Inference:. 1. Dialogue on Reverse Engineering Assessment and Methods: the DREAM of High Throughput Pathway Inference: Gustavo Stolovitzky, Don Monroe, Andrea Califano. 2. ENFIN - A Network to Enhance Integrative Systems Biology: Pascal Kahlem and Ewan Birney. Part II: Overview of Reverse Engineering Methods: Experiment and Theory:. 3. Reconstructing Signal Transduction Pathways: Challenges and Opportunities: Arnold J. Levine, Wenwei Hu, Zhaohui Feng and German Gil. 4. Theory and Limitations of Genetic Network Inference from Microarray Data: Adam A. Margolin and Andrea Califano. Part III: Establishing In-Silico and Experimental Gold Standards and Performance Metrics for Reverse Engineering:. 5. Comparison of Reverse Engineering Methods Using an In-Silico Network: Diogo Camacho, Paola Vera Licona, Pedro Mendes and Reinhard Laubenbacher. 6. Benchmarking of Dynamic Bayesian Networks From Stochastic Time-Series Data: Lawrence A. David and Chris H. Wiggins. 7. Reconstruction of Metabolic Networks from High-throughput Metabolite Profiling Data: In-Silico Analysis of Red Blood Cell Metabolism: Ilya Nemenman, G. Sean Escola, William S. Hlavacek, Pat J. Unkefer,Clifford J. Unkefer and Michael E. Wall. 8. The Gap Gene System of Drosophila Melanogaster: Model-fitting and Validation: Theodore J. Perkins. Part IV: Theoretical Analyses of Reverse Engineering Algorithms:. 9. Algorithmic Issues in Reverse Engineering of Protein and Gene Networks via the Modular Response Analysis Method: Piotr Berman, Bhaskar DasGupta, and Eduardo Sontag. 10. Data Requirements of Reverse-engineering Algorithms: Winfried Just. Part V: Some Reverse Engineering Algorithms:. 11. Improving Protein-Protein Interaction Prediction based on Phylogenetic Information using Least-Squares SVM: Roger A. Craig and Li Liao. 12. Reverse-Engineering of Dynamic Networks: Brandy Stigler, Abdul Jarrah, Mike Stillman and Reinhard Laubenbacher. 13. Learning Regulatory Programs that Accurately Predict Differential Expression with MEDUSA: Anshul Kundaje, Steve Lianoglou, Xuejing Li, David Quigle, Marta Arias, Chris H. Wiggins, Li Zhang and Christina Leslie. Part VI: Reverse Engineering of Parameters in Quantitative Models:. 14. Extracting Falsifiable Predictions from Sloppy Models: Ryan N. Gutenkunst, Fergal P. Casey, Joshua J. Waterfall, Christopher R. Myers and James P. Sethna. 15. Dynamic Pathway Modeling: Feasibility Analysis and Optimal Experimental Design: Thomas Maiwald, Clemens Kreutz, Andrea C. Pfeifer, Sebastian Bohl, Ursula Klingmüller and Jens Timmer. 16. Sensitivity Analysis of Computational Model of the IKK-NF-ĸB-IĸBά-A20 Signal Transduction Network: Jaewook Joo, Steve Plimpton, Shawn Martin, Laura Swiler and Jean-Loup Faulon. Part VII: Integration of Prior Information in Reverse Engineering Algorithms:. 17. A Framework for Elucidating Regulatory Networks Based on Prior Information and Expression Data: Olivier Gevaert, Steven Van Vooren and Bart De Moor. 18. CellFrame: A Data Structure for Abstraction of Cell Biology Experiments and Construction of Perturbation Networks: Yunchen Gong and Zhaolei Zhang.